Cane toad is a true toad belonging to the Bufonidae family. It is quite big in size compared to other members of its family. This amphibian is very interesting to observe. Its looks, its defense mechanism, everything about this species suggest how interesting can be nature’s creation. Read below to find out all about this interesting amphibian species. 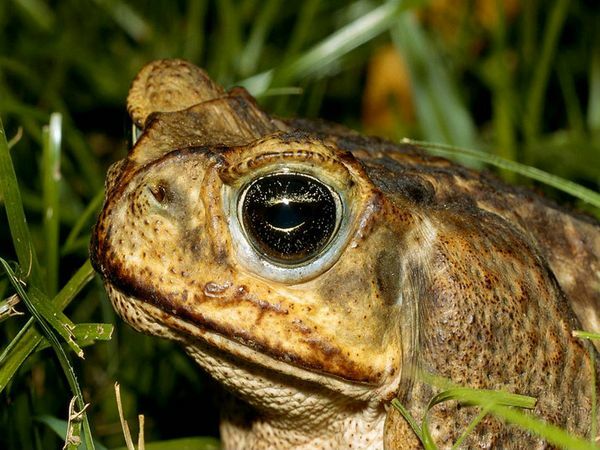 Size : An average adult Cane toad is of 4 inches to 9 inches in size. Weight : These toads usually weigh about 1.8 kg. Color : They come in varied colors. Mostly they are seen in olive-brown, reddish brown, yellowish and grayish. Their underneath parts are pale white or yellowish. Their bodies have darker colored patches all over in uneven distribution. Head : They have triangular shaped bony heads, that proceeds in front from their eyes to nose. Two ears are located on two sides of the head. Behind their ears they have parotid glands. These glands secrete toxin. Body : They have very rough and dry skin. Their hind limbs are webbed but front ones are not. Their legs are very short and flexible, helping them in hopping. Cane toads are very interesting to observe. Their behavioral traits form much of their defense mechanism also. They sit straight upright and hop short distances to move forward. They are nocturnal beings. They get active at night. These toads need extreme humidity to survive. They tend to inhabit near water bodies in the wild and need the same when being petted. They cry out loudly in purring thrill for mating. Young Cane toads are not solely nocturnal. They stay active during both days and night. This species of toad mostly diet on insects. They also prey on small animals that they can digest like small lizards, tiny birds, frogs, fishes, worms, bees, mice, scarab beetles and dung beetles. Sometimes grown up Cane toads even prey on young Cane toads. South and Central America are native lands of this species of toad. The species was later introduced Venezuela, Caribbean Island, Philippines, Puerto Rico and Florida. This species is now also found in Hawaii and Australia. These toads originally inhabit subtropical forest areas near water bodies. Due to human dispersal their habitat also dispersed into drains, pipes, gardens, debris, junk dumps near residential areas. Their basic habitat is dry lands but they need they need shallow water bodies for reproduction. Cane toads have many predators in their original habitat. Banded cat-eyed snake, several sub-species of killifish, eel, rock flagtail, many sub-species of ibis and some species of catfish are their most common predators in the wild. Predators outside their wild habitat include Rakali, Whistling kite, Water monitor lizards and Black rat. These toads have several adaptive features in order to protect themselves from their numerous predators. They inflate their lungs, increase their body size and appear larger before their predators to dodge them. When these toads feel threatened their bodies secrete a certain kind of fluid called bufotoxin. This fluid is highly toxic and can be fatal for animals. Even human deaths have been reported due to consumption of this toad. 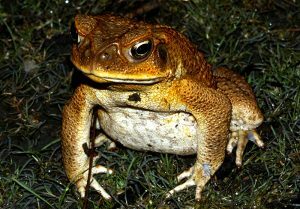 Peak mating and breeding season of Cane toads is between April and September. Female toads reproduce jelly-like egg clutches, consisting of 8000 to 35000 eggs in each of them. These eggs are then fertilized externally. Male toads drop their germ cells on the eggs and help them mature. Those eggs fertilize into small, shy, black colored tadpoles. All the eggs fertilize into tadpoles but only 0.5 percent of them survive till adulthood. Usually tadpoles hatch from the egg within 48 hours of being laid. Sometimes the incubation period can drag on till a week. Sometimes the eggs also hatch within 14 hours. These tadpoles turn into toadlets in a time span between 12 days and 60 days. Their growth pace slows down when they attain sexual maturity. An average adult Cane toad can live for any time duration between 10 years and 40 years. Check the state laws of petting Cane toads. Get proper permits and bring home the favorite amphibian. Housing : 30 gallons’ measurement tank is required to house this toad at ease. Provide some tree barks and create a litter looking habitat inside the tank. A shallow container with water should be kept inside. Keep a log inside for the finishing touch. Temperature : Temperature is a very important aspect to be kept in mind while housing Cane toads. Humidity should be kept between 70 percent and 100 percent to keep them alive. These toads cannot survive in any less humidity than this. 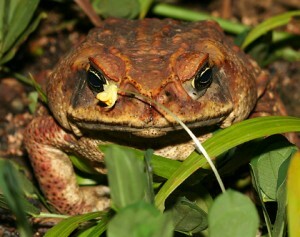 Food : These toads are carnivorous and can be given anything to eat. They eat small insets to grown up mice. Maintenance : These toads secrete a toxin from their skin which is poisonous. It is advisable not to handle them by touching. 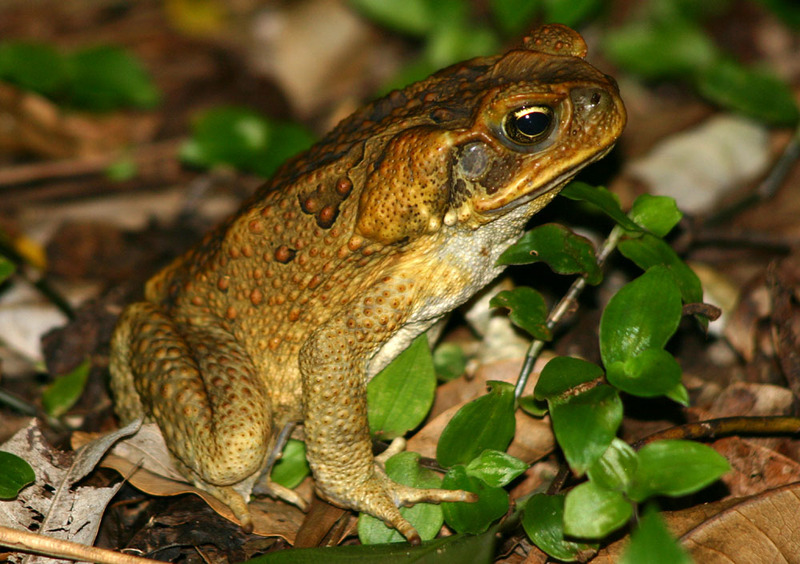 According to IUCN reports Cane toads are being listed as Least Concerned. Their existence is not under threat given their natural habitat or diet is all safe and found in abundance. Find out some very interesting points about Cane toad below short listed in congregation. These toads inflate their lungs and make themselves look bigger in size to trick away their predators. They need lot of moisture to survive. They require minimum 70 percent humidity. Though they live amidst moisture laden areas and need lot of humidity to survive but still their skin is very dry. These toads fertilize their eggs externally. Incubation period of these toads’ eggs vary enormously. Sometimes the hatch within 14 hours and sometimes it takes about a week. Amongst all the eggs laid by these toads only 0.5 percent survive till adulthood. Check out the pictures below and know how this incredible amphibian looks like.